Special Savings Special Needs: Stock up on batteries for Christmas! Less than$1 after gift card! Stock up on batteries for Christmas! Less than$1 after gift card! 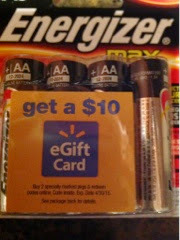 Check for energizer batteries at wal-mart with a rebate code attached. Wal mart had the 8 packs for $5.97. Buy 2 marked packages and receive a $10 wal mart eGift card...making them $.97 out of pocket. Christmas is coming...along with all those battery operated gifts!